Climate Change: The Next Generation: 97 HOURS OF CLIMATE CONSENSUS: JOHN COOK RULES!!! The campaign was inspired, in part, by our research which has shown that less than 12% of American adults are aware of the scientific consensus about human-caused climate change, that people who understand there is a scientific consensus are more likely to support actions to slow climate change, and that simple messages from credible sources can help set the record straight. Every hour, for the next 97 hours, a statement by a leading climate scientist - featuring a playful hand-drawn caricature of the scientist - will be published and shared on social media around the world. 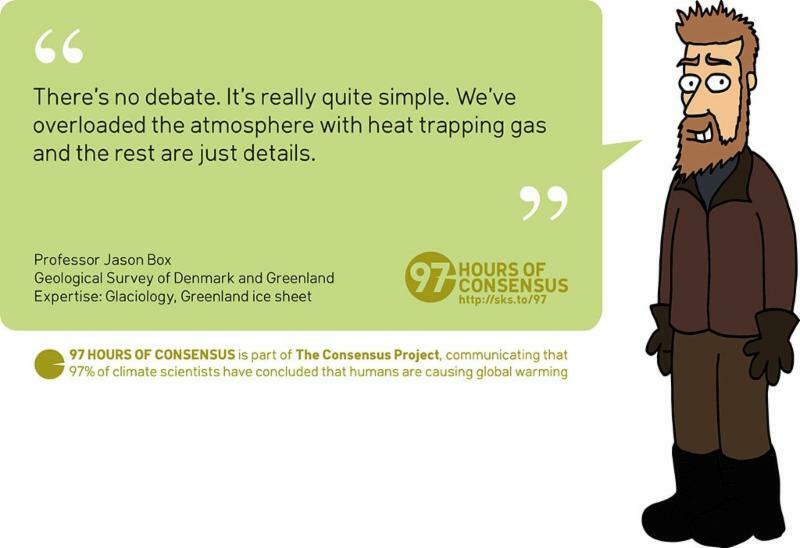 The "97 Hours of Consensus" campaign was created to communicate the fact that 97% of climate scientists have concluded that humans are causing global warming. The campaign's lead developer -- and the artist who drew caricatures of the 97 climate scientists -- is John Cook, a research fellow in climate communication with the Global Change Institute at The University of Queensland, and founder of climate change website Skeptical Science.